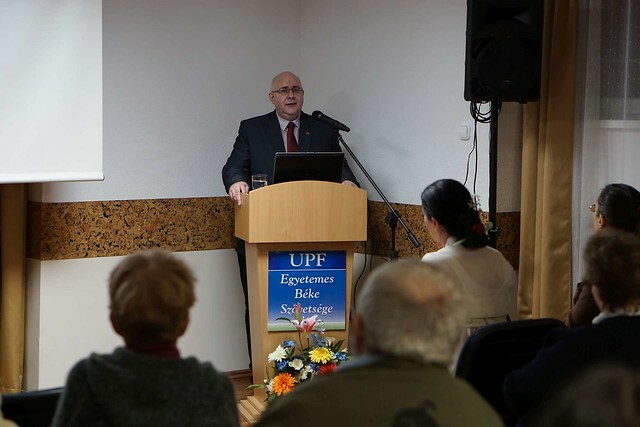 This first UPF-Hungary event of 2019 was held in the Peace Embassy on January 24. This year marks the 30th anniversary of Hungary establishing diplomatic relations with the Republic of Korea. Among the former communist countries of Europe, Hungary was the first that opened to South Korea on January 29, 1989, when Hungary was not yet a democratic nation. Furthermore, Hungary was the nation that did away with the Iron Curtain at the Hungarian-Austrian border in May 1989. The program began with the showing of a documentary film made by the South Korean television channel MBC, The Road to the End of the Cold War. This moved the audience, seeing how much effort the UPF founders made to win over communism. Then the UPF feature video that was prepared for the Asia Summit 2018 was shown, which gave additional evidence of the works of the UPF founders to solve the problems of humankind. Next, the poem that UPF founder Rev. Dr. Sun Myung Moon wrote at the age of 16, “Crown of Glory,” was recited by Oliver Bajor, also age 16. This poem touched the hearts of the Ambassadors for Peace who were present. The main lecturer was a professor from the Korean faculty of Eötvös Loránd (ELTE) University, Gabor Osvath. He introduced Korean literature writings that have been translated into Hungarian. He emphasized the filial piety and loyalty that appear many times in Korean literature. Several performances of Korean music and dance followed. Kiara Krebsz on piano and Agota Gadzhev on violin provided music for Dr. Monika Toth as she demonstrated Korean traditional dance. She and the Mugunghwa Dancer Group are becoming well known both in Hungary and overseas. The star guest was Kamilla Dévai Nagy, a folk singer who has received several awards from the Hungarian government and is also a UPF Ambassador for Peace. She gave a beautiful performance of the Korean song “Arirang” for the guests. Ms. Dévai Nagy related her experience of performing on a live-TV show in North Korea, while Kim Il-sung, then the North Korean leader, was present in the neighboring room. During the rehearsal she was removed from the stage because she started singing “Arirang.” The audience was touched and they cried, yet the security guards took her off the stage. She could not understand why. During the live-TV broadcast of her concert, at the very end she had the courage to once again sing “Arirang,” at the risk of her life. The audience again burst into tears, and this time she was allowed to finish the song. Later she came to know that in 1987 “Arirang” was banned from being sung in North Korea. The closing remarks were given by UPF-Hungary President Tibor Krebsz. He emphasized the importance of the unification of South and North Korea, explaining that unification is the way to bring reconciliation among the great powers supporting the communist and democratic parts of the country. This is the way to create world peace. He encouraged the Ambassadors for Peace to go out and represent these ideas without hesitation.